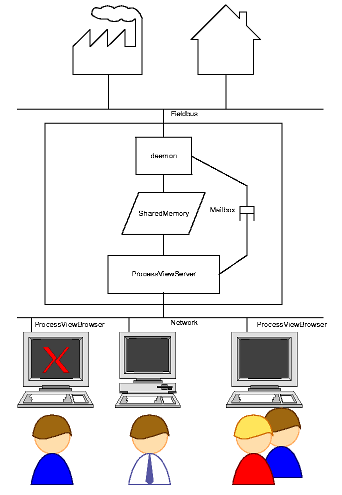 Process Visualization is often done with commercial software under Windows. In contrast pvbrowser, pvb® is open source software that runs on Linux/Unix/Windows/OS-X. pvbrowser clients are also available for Maemo/MeeGo/Android. additionally pvbrowser servers can run on OpenVMS. If you connect such a system to a network you must be aware of security risks. With pvbrowser you can choose the operating system which promises best security. This is especially important for the server software where clients may run in less secure environments. The client could contact the server via SSH or VPN, for example. pvbrowser is used for HMI and SCADA. The most well known Client-Server Architecture is the world wide web. The user runs the client software on his desktop. This is your internet browser. The server runs somewhere reachable over the internet. These web servers host the web pages. The user can now connect his internet browser (client) with the web server (server) using an URL (Uniform Resource Locator). Now, the server delivers the web page to the client and the user can read it. By clicking a link the user can instruct his internet browser (client) to connect to a different web server. Thus, it is possible to browse the web pages on the internet. The same principle is used with pvbrowser. 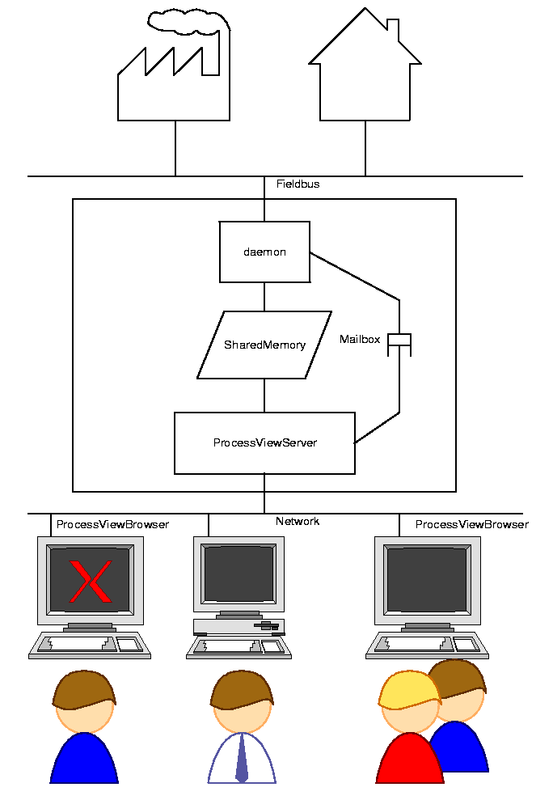 The user runs the client (pvbrowser) on his desktop. pvbrowser can now connect a server (pvserver) using an URL. With pvbrowser you can browse all the visualization servers (pvservers) in the same way as you do with an internet browser. pvbrowser, pvb® is an application framework. It provides a specialized browser for the client computer and an integrated development environment for creating servers that implement your visualization. It also provides data acquisition programs (daemons) for a lot of protocols that connect the real world with your server. You can surf these visualizations as you do with an ordinary web browser. Many users from different places can use the visualizations at the same time. This can be limited to your local area network which is isolated in a secure zone or even across the internet after you have taken the necessary safety measures . Get pvbrowser, pvb® for your operating system. The GPL license is used for the executables (pvbrowser, pvdevelop). Our libraries are under LGPL. Thus, you can develop your pvserver without the need to publish the sourcecode.